My husband and I had some airline miles to use up, so we planned a short trip to Colorado. I fell in love with Colorado years ago. When I was 23, (a long time ago haha), a friend and I quit our jobs and backpacked around the country. Colorado was one of my favorite states. We spent a couple weeks just exploring. It has quite a diverse terrain depending on where you are in the state. We chose the Denver/Boulder area for this trip. I had never been to Boulder, so I was excited. Just a warning. This post is very picture heavy. We chose to stay at the Westin Westminster in Westminster, Colorado. 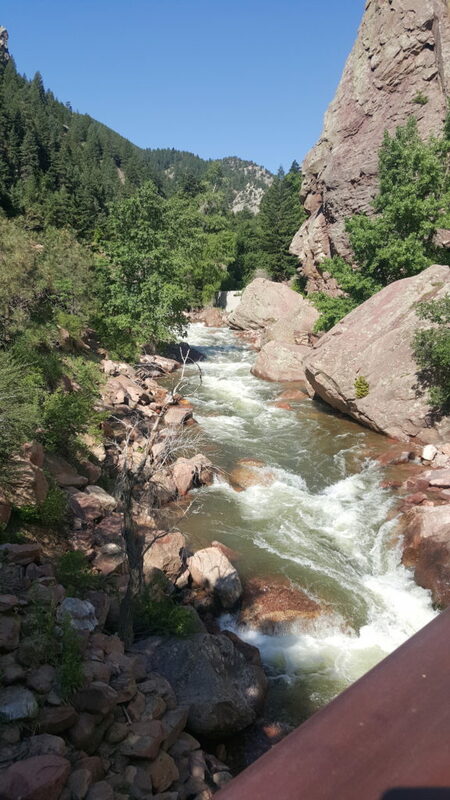 It was halfway between Denver and Boulder, so it was a great location for us. Plus, the Westin is known for their fabulous beds and trust me, they do not disappoint. We arrived at the hotel early, at about 10 am. I didn’t expect our room to be ready, but it was! We hadn’t eaten breakfast yet, so we went to The Kachina Southwestern Grill inside The Westin. All the menu items are labeled on whether they are vegetarian, gluten free, etc. So you don’t have to guess. 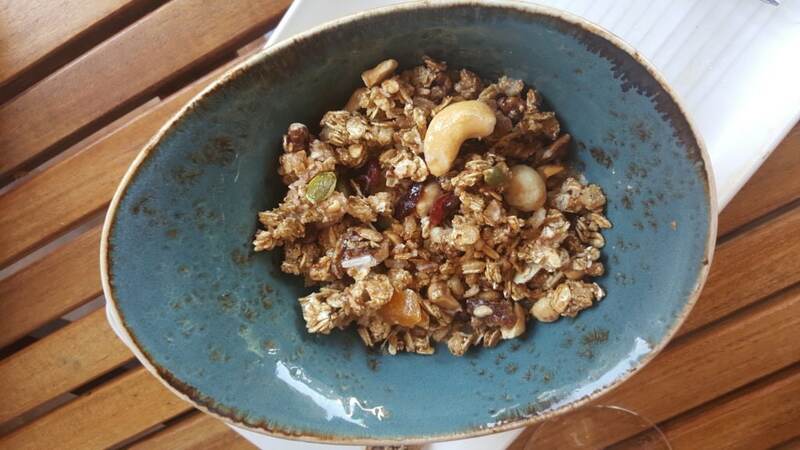 I got their house made granola with almond milk. Hubby, who is not vegan, got eggs. 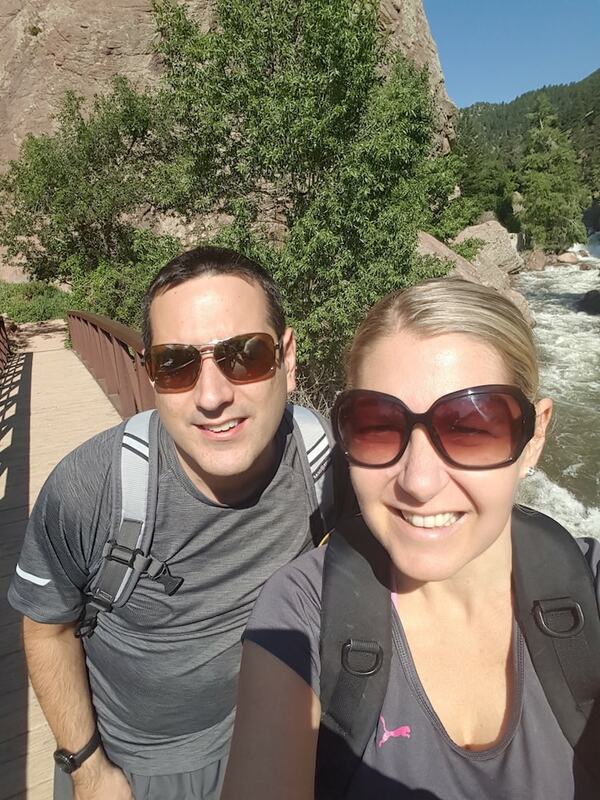 After we ate, we headed out The Flatirons in Boulder for a hike. It comes highly recommended from Trip Advisor. There are many levels of hikes to choose from, so it’s easy to find the one that suits your activity level the best. We chose the Amphitheater Trail, which is a moderate level trail with some definite elevation gain. The other trail pictured here, the Bluebell-Baird trail, is an easier trail with less of an elevation gain. 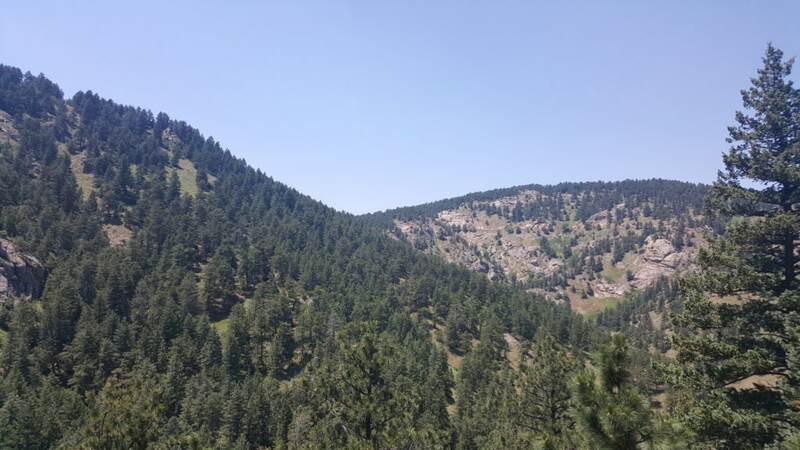 However the easier trail is not shaded at all, so it can get quite hot. It was in the 90s the whole time we were there. Here is our view from the top. After the hike, we stopped into Whole Foods in Boulder for a quick snack. We had dinner plans with a few friends, so we wanted to save our appetites for that. 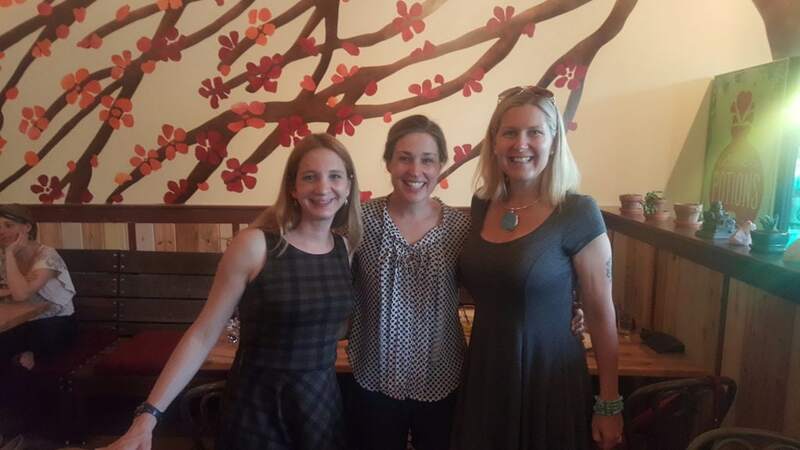 We met our friends in Boulder at an awesome restaurant called, Shine. It was just off the famous Pearl Street Shopping area. While it wasn’t completely vegan, it did have tons of vegan options. The other great thing about Shine was that it was all organic, gluten free, non GMO, they got ingredients from local sources, made their own beer and infused vodka, and only used sprouted grains. They also have some great happy hour specials. I got the house made veggie burger and hubby got the jackfruit tacos. We also got a vegan chocolate mousse for dessert. So delicious!! It was great to meet up with old friends. It had been years! The next day, we planned another hike. 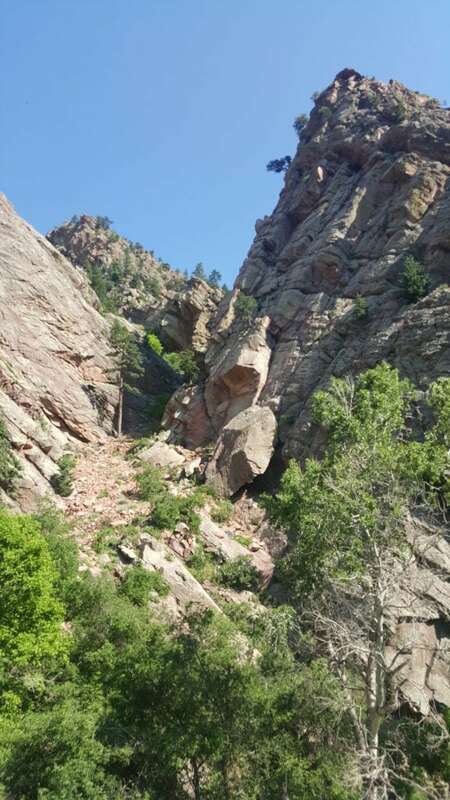 This one was in Eldorado Canyon. This was another place highly recommended by Trip Advisor. 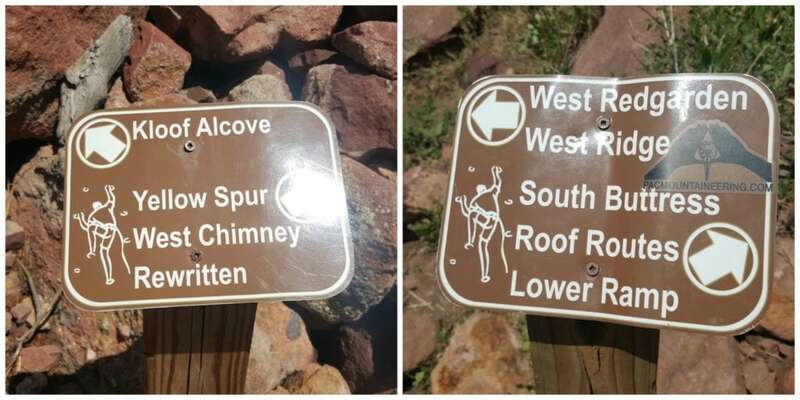 We did a couple of trails that led to access for mountain climbing. Both were about moderate level hikes and it got us pretty high up. A few gorgeous views from the top. A little hard to tell from the pic, but we could see the entire Denver skyline from this view. On the way down, we hiked along this breathtaking river. We were starved when we got done with this hike, so I used happycow.net to locate a vegan restaurant nearby. That was when we discovered the awesomeness that is Native Foods. We don’t have them in Texas, so this was a treat. 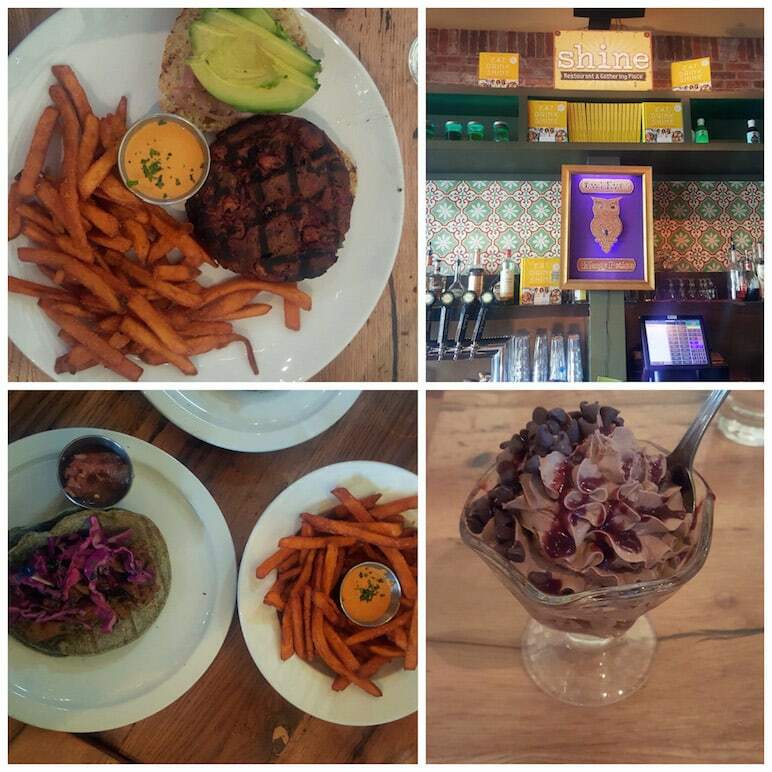 Their entire menu is plant based and the have scrumptious desserts too! 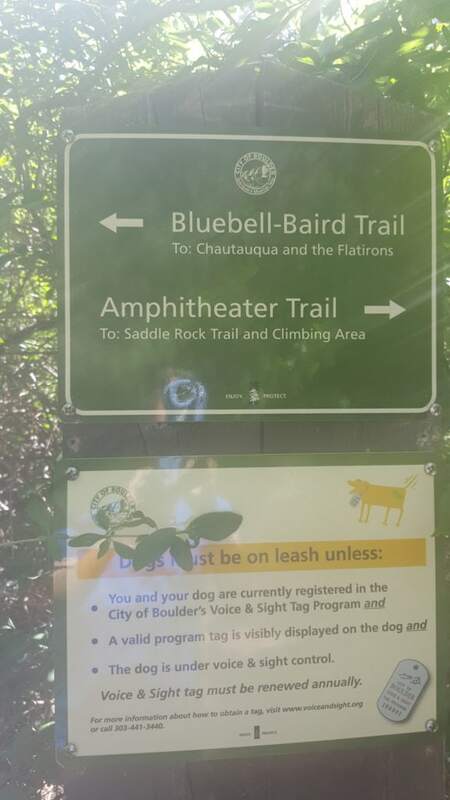 We went to the Boulder Location. I got the Oklahoma Burger and hubby got the nachos. For dessert, I got the oatmeal cream pie and hubby got the chocolate cupcake. This may have been one of the BEST vegan meals I have had in a long time. That night, we had plans to meet one of my friends in downtown Denver. We headed to Larimer Square which is a one black section of Denver that has a lot of shops and restaurants. The buildings have some great architecture too. We met at Corridor 44, which is a champagne bar. They were having happy hour specials from 4-6pm. The specials are $4 well drinks $4 draft beers and $4 champagne cocktails. The champagne cocktails were fabulous! I tried the pomegranate and the strawberry sunrise. I would recommend them both! 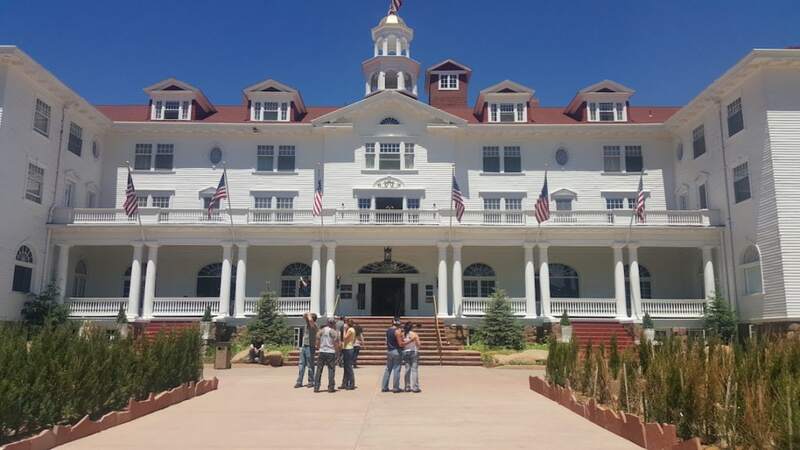 The next day, we didn’t really have anything planned, so we took a drive to Estes, Colorado to check out The Stanley Hotel. This was the hotel that was featured in The Shining. 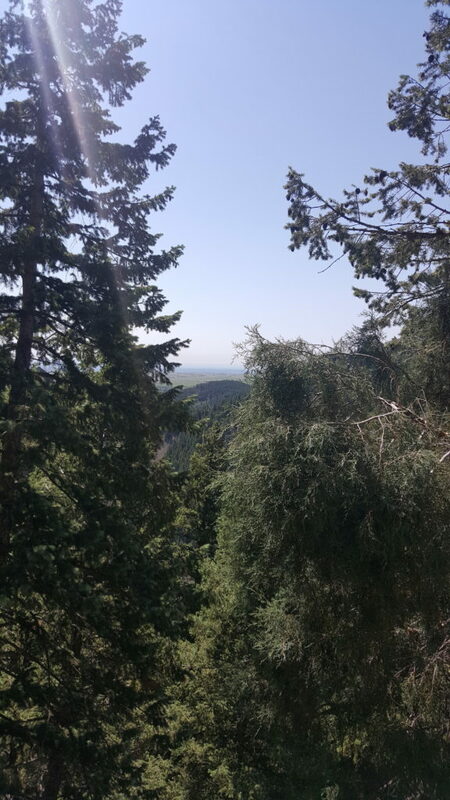 It’s set in the mountains and the views are just amazing. They do offer tours of the hotel and also ghost tours, but we arrived too late in the day for that. The surrounding landscape made the 1 hour drive worth it though! 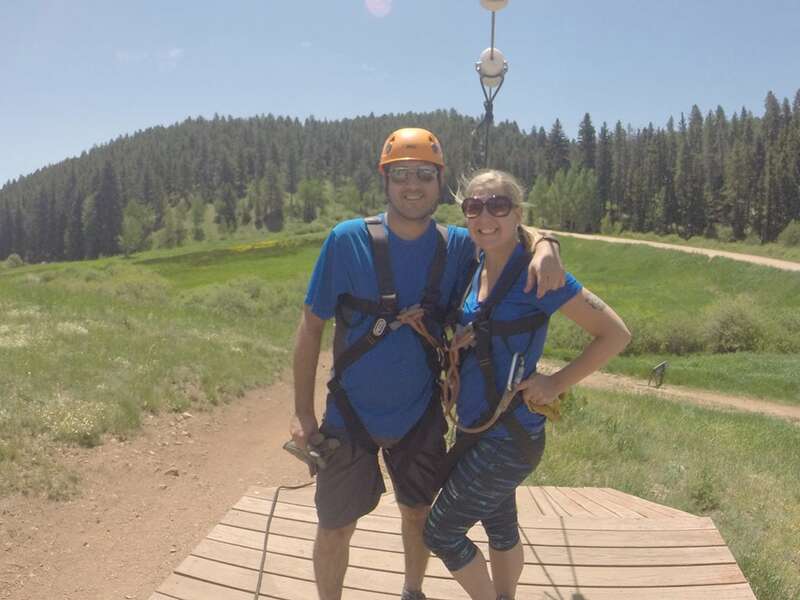 The following day, I had booked us to do a zipline tour with Denver Adventures in Conifer, Colorado. It’s about a 45 minute drive from Denver. They also do other outdoor guided activities like climbing, biking and hiking. The ziplines were a blast! I would definitely do it again. I am not wearing my helmet in this picture, because the guide is taking this picture with the Go Pro attached. After the zip line tour, we headed back to Native Foods to eat again. I seriously want to try the entire menu! This time, I got a salad wrap and hubby got the burger I got last time. We loved this meal too! Since we were leaving the following day, we headed back to Pearl Street to check out some of the shops. We wanted to bring something back for the girls. There is a book store called Peppercorn there, and I noticed they were selling my book. They had 4 copies and I signed all 4 of them. I did ask permission and they said yes. 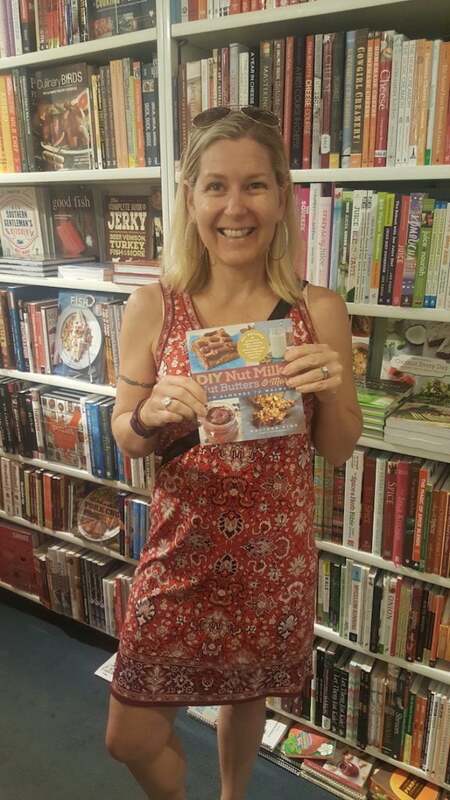 They did have a HUGE selection of plant based and healthy cookbooks there, so it’s definitely worth the trip. The day we were due to fly out we wanted to eat some breakfast before we got to the airport. 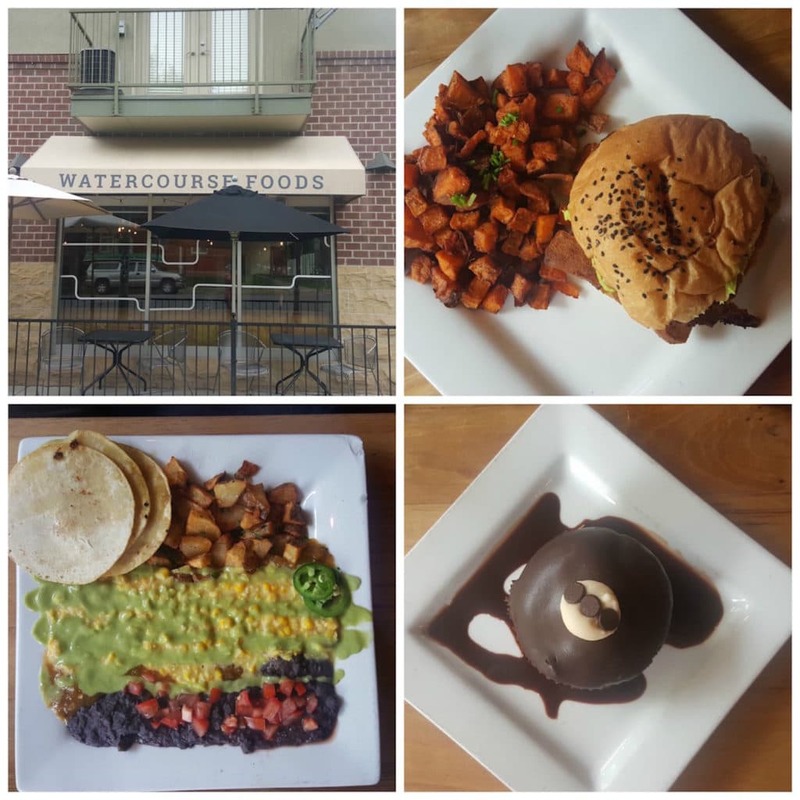 I heard Watercourse in downtown Denver was awesome, so we headed over there. The entire menu is plant-based. I got a breakfast “egg” sandwich and hubby got verduras rancheras, which was creamed corn, green chili, re-fried black beans, home fries, jalapenos, avocado creme and cilantro. My “egg” was chickpea based. I also got a side of sweet potatoes. So delicious!! They even made their own ketchup! I also got a dessert to try since they make them all fresh. The Ho Ho Cupcake sounded too good to pass up. It was very rich and large and could easily be shared by 3 people. Hubby loved his meal too! 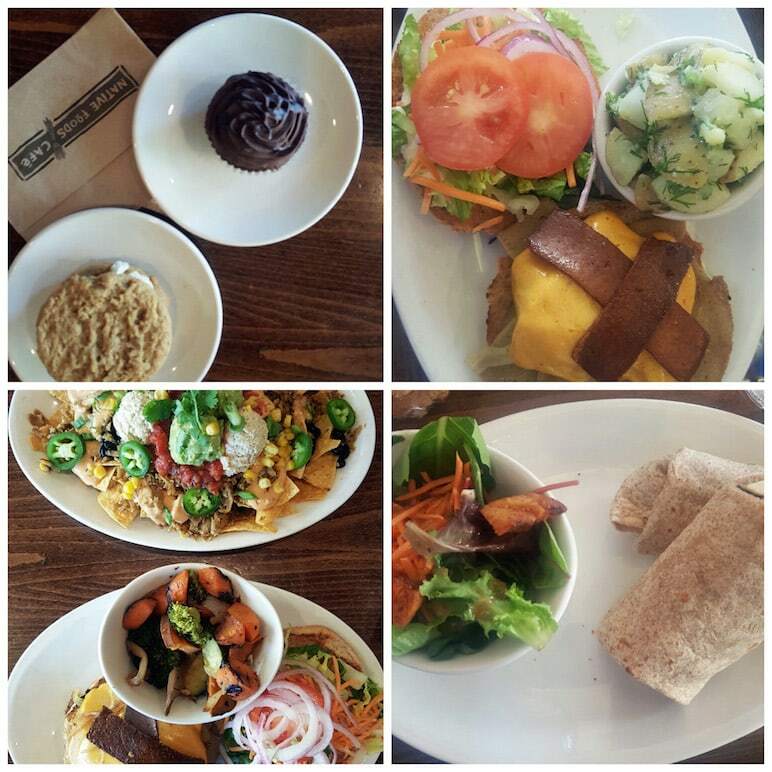 If I come back to Denver again, I am definitely going to go back for lunch or dinner too. All in all it was a great trip and I can’t wait to go back and take my kids. If you want to check out more travel posts, I have several others under the Vegan Travel. You can also follow me on Instagram, and now Snapchat for behind the scenes travel posts. My snapchat name is mywholefoodlife. Glad you had fun in Colorado! :) We sure love our home, and are always excited to welcome vegan visitors and proud to be able to accommodate them easily! :) *side note* The link for the stainless steel containers does not seem to be working... :-/ Thanks!! We really did! Colorado is a beautiful place for sure. I am looking forward to going back. :) I will also check out that link. Sorry it's not working! Hi Mague! Thanks for buying the books! Nuts sometimes need to be soaked in certain recipes. If you are making milk, vegan cheese, or any soft dessert like cheesecake, the nuts need to be soaked. If you are making nut butters, there is no need to soak. I hope that helps! :) I am so glad you are liking the travel posts as well. Ahhh! Native Foods! I was a baker at Native Foods in Chicago for a year. Can't even guess how many oatmeal pies I made! Your recipe is definitely healthier ;) Unfortunately, working there ruined the food for me and the Chicago branch is unethical but I am glad you had a yummy meal in Colorado. Finding quick affordable 100% plant-based food can be a challenge! Oh wow! I know it's not 100% healthy, but we were doing a lot of hiking and we were on vacation, so I am okay with a little splurge. How were they unethical in Chicago? Employees are treated poorly and they are always cutting corners to save a few bucks :( I heard that the ones out West are better managed. This post came at a great time, we will be traveling through CO next week, first stopping in Boulder! Great dining suggestions and hiking - THANKS! Yay! So happy it was helpful to you. Enjoy your trip! I stayed there for an AmeriCorps training a couple of years ago, and the higher altitude nearly did me in, haha. Even the short walk to the movie theater and the sports bar with a few people one night winded me beyond belief and I had to stop a couple of times. Did you get to meet Westy? She's beautiful, but very, very aloof. I took her out a few times during my stay, and the only thing that made her interact was people food. That's probably why she's so chubs. The altitude is definitely something to get used to! :) Who is Westy?